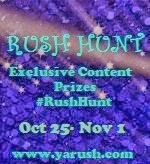 YA/NA Scavenger Hunt: Rush Hunt is now on. Get exclusive content, including from my debut novel SLEEPER (out December 2). Check out Lola’s Reviews for my Scavenger Hunt stop. Also there are awesome bookish prizes.